In the Contribute browser, browse to the page you want to copy. Click the New button (or Select File -> New from the Contribute menu). A New Web Page or Blog Entry dialog box will appear. 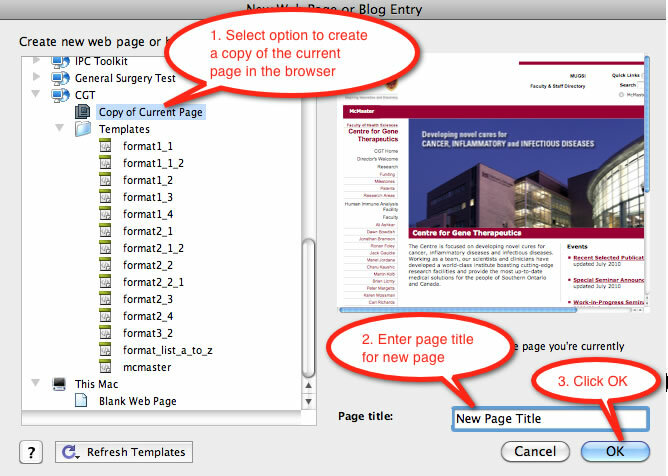 Select current page, enter a page title and click OK to create the new page that is a copy of the page that was currently in the browser. Note: The Page title from the New Page dialog box is the text that will appear in the title bar at the top of the browser window. If a visitor adds your page to their favourites (bookmarks), the page title is the default name it will give the bookmark. Search engines use the page title as the listing name for their results. In HTML the page title is delimited by the <title>page title</title> tag. You should keep the text of the page title as brief as possible. A draft entry with the page title will be listed next to a draft icon under Pages in the Draft Console left panel. The draft will remain open until the page is either published or discarded, even if you close Contribute and continue working at another time. A copy of the draft will be saved on the server in a temparary location. The new web page you just created will appear in the editing pane on the right. Change the text in the blue box with the name "page_title". Enter the content title you want to appear at the top of the page content. (This title is not the same as the page title you entered when you created the page.) In HTML the text in this box will be delimited inside of the <h1>Title of Content</h1> tag. When search engines index the page, they will look for the <h1> tag as an important resourse to discover what the page is about. You should not use <h1> tags anywhere else on the page. You should use <h2>, <h3>, <h4>, etc instead. You may save your work and continue at a later time by clicking the Save for Later button at the top of the pane. A copy of the draft will be saved on the server in a temparary location. To continue editing the page, click on the draft under Pages in the Draft Console left pane. You may delete the draft of the page by clicking the Discard Draft button at the top of the editing pane. You will be asked to confirm that you want to discard the draft. After you have updated and reviewed the content on the page, click the Publish button on the Contribute toolbar. Contribute will display a warning to remind you that the page must be linked into the website. Click Yes to continue publishing. You may turn off this warning by clikcing the checkbox. Since this is a new web page, a Publish New Page dialog box will appear. By default, the filename for the new web page is the same as the page title that was entered in Step 5 above, except that Contribute removed any embedded spaces in the name. Change the filename so that all alphabetic characters are in lower case. Also, if you want to break up the words in the name, you may use underscores instead of spaces. 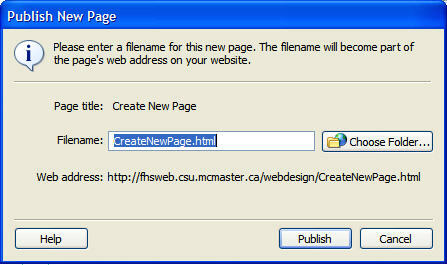 For example, the filename might be changed from CreateNewPage.html to "create_new_page.html". You may also choose a Folder in which to put the page. Unless your website is very large, however, it is recommended that all HTML files be left in the root directory of the website, which is the default location in the Publish New Page dialog box. 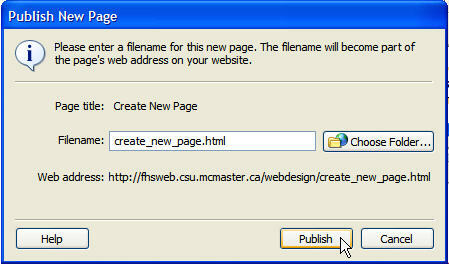 Click the Publish button in the Publish New Page dialog box. A dialog box appears that says "Congratulations! You have successfully published the page". Check the box if you don't want this box to appear after you publish a page. The webpage and all other files that you have added (images, documents, etc.) have now been uploaded to the server and the draft of the page has been deleted. Check how the page looks in your browser. Test all links that you added to the content.